Background: Mark is a professor of chemical engineering at the California Institute of Technology (Caltech), and is a member of the National Academy of Engineering, the National Academy of Sciences and the Institute of Medicine. He received his BS, MS and PhD degrees from the University of Kentucky. Track Highlights: Mark was a full scholarship sprinter on the University of Kentucky’s track and field team in the 1970s. He began running Masters events in 2006. 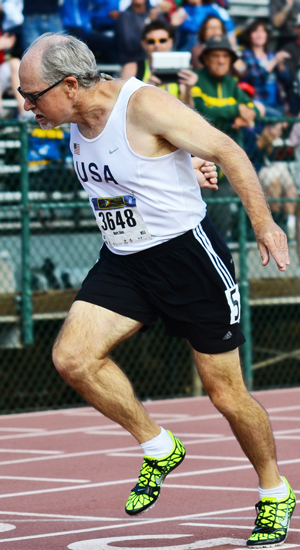 At the 2011 World Masters Athletics Championship in Sacramento, he placed first in the 400 Meters, third in the 200 Meters and eighth in the 100 M. Additionally, he was a member of USA’s winning 4 X 100 relay (handed off to Houston Elite member Kevin Morning) and winning 4 X 400 relay (handed off to Houston Elite member George Haywood).